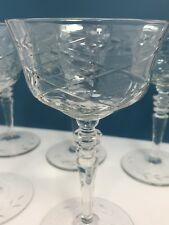 Set of 8 Vintage Coupes..not just 4..perfect for Champagne or a craft cocktail! 7 VINTAGE TALL CUT CRYSTAL CHAMPAGNE COUPES GLASSES 6 1/2” EXCELLENT! 6 Vintage Hollow Stem Champagne Coupes Glasses Leaf-Etched Hand-Blown Stunning!